Socialist firebrand and federal minister, Edward John Russell, was born on 10 August 1878 at Warrnambool, Victoria, the son of Joseph Russell, a baker born in Ireland, and his wife, Melbourne-born Mary Frances, née Conway. Russell arrived in Melbourne with his family in 1890, during the great maritime strike, and was educated at Newport State School and St Mary’s Roman Catholic school at Williamstown. He became a dray driver, then a tinsmith and later an office clerk, but also found time to develop his public speaking skills through participation in literary and debating societies. In June 1904, ‘Ted’ Russell ran unsuccessfully as the Labor Party’s candidate for the state seat of Prahran. According to a later account, he was at this time a ‘rosy-cheeked, fresh, slim, athletic young man—the pride of his friends and himself’. Russell joined the Victorian Socialist Party in the year of its foundation—1906. A committed member of the Party, the ‘boy orator’, as he became known, continued to develop his debating and administrative skills. On 30 April 1907, Russell married a fellow-socialist, Maggie May Evans, at St Ambrose’s Roman Catholic Church in Brunswick. In 1906, Russell ran successfully for the Senate as a Labor candidate with the support of the Socialist Party and, somewhat ironically, of the Roman Catholic newspapers. The only successful Labor Senate candidate from Victoria, he came third in the poll. The victory was a surprising triumph for a young candidate who had no experience of public office, lacked a strong trade union base, and was virtually unknown outside the Socialist Party. His oratory, however, won him respect and undoubtedly enhanced his electoral prospects. If I were asked to-morrow to vote by way of a referendum on the question, ‘Socialism or no Socialism’, I would vote on the ‘No Socialism’ ticket. I would not be a party to forcing it upon an unwilling people even if I could . . . I am a democrat first, and then a Socialist . . . I am a straight-out Laborite, prepared to proceed on Socialistic lines only as far as the people’s education will allow them to go. Russell continued to build a reputation as an eloquent speaker. Moreover, he sharpened his political skills, and was described in 1911 as a man who, in the arena of politics, had ‘mastered all the moves just as though it had been a great game of chess’. He was now ‘to be reckoned with’, and ‘as clever and as far-seeing as the hoariest greybeard on the comfortable benches of the Senate’. Like most Victorian Labor men, Russell was a staunch protectionist who wanted to see goods made ‘in a White Australia, where the employés are treated as white men, and receive sufficient remuneration for their toil to be able to lead decent white lives’. He considered Australia’s tariff too low and agitated regularly for an increase, even when Labor was in government. In his early years as a senator, he was an assiduous representative of the interests of the trade unions in Parliament. He frequently brought the grievances of various groups of workers before the Senate. An admirer of H. B. Higgins’ landmark Harvester Judgment, Russell, like most of his fellow Labor moderates, saw in the establishment of the Commonwealth Court of Conciliation and Arbitration Court an opportunity to resolve industrial disputes and improve the conditions of the workers. He argued that ‘our object should be to make the arbitration law as cheap, efficient, and workable as possible to both sides’. Early in his parliamentary career, Russell reflected many of the anti-militarist ideas of Tom Mann and the Victorian Socialist Party. He was unenthusiastic about compulsory military training, but, as international tensions grew, Russell gradually changed his mind. He recognised that Australia could not take an independent course in world affairs. In 1909, he told the Senate: ‘All the other chaps possess a gun. Under these circumstances, are we justified in sitting down idly and refusing to take a gun in our own hands for the purpose of defending ourselves? I do not think that we are’. Russell now claimed that compulsory military training was a democratic policy, necessary for Australia’s defence. He even supported conscription for young men which he had originally opposed. In 1914, he acknowledged the dramatic transformation of his opinions about defence policy: ‘Before I entered Parliament, not having given close consideration to the matter, I was one of those who hated the sight of a soldier, and the thought of war; but we must yield to common sense. Australia must be defended’. He thought that the defence system had ‘done more to develop our national spirit than anything else’. Meanwhile, Russell won various offices in his party, the Senate and the Government. He was appointed to the Senate standing orders committee and, from July 1913 to October 1914, was a member of the executive of the Federal Parliamentary Labor Party. He became a Temporary Chairman of Committees (1913–14) and a member of the select committee on the 1913 general elections. In September 1914, he was elected an Assistant Minister in the Fisher Ministry. He retained the position when the Ministry was reconstructed by W. M. Hughes in October 1915. During the war, Russell was responsible for the passage of a large amount of financial legislation in the Senate. As a member of the Government, Russell threw himself into the prosecution of the war effort. In September 1916, the executive of the Political Labor Council of Victoria, which opposed Hughes’ conscription proposals, called on the Victorian members of the Hughes Ministry to resign. Russell opposed conscription for overseas service, but he refused to resign immediately. He later claimed that he had asked Hughes to relieve him of his duties during the conscription campaign, because he considered that, as an anti-conscriptionist, he could not sit behind Hughes while unable to support him on such an important matter. Hughes, however, begged him to remain in the Ministry. On 27 October 1916, Russell with two other ministers resigned from the Ministry after Hughes persisted with a proposal to have suspected call-up defaulters questioned at polling booths and their votes kept separate. Despite this disagreement, Russell followed Hughes from the party room at the dramatic Caucus meeting on 14 November 1916, the sole Victorian member of the Labor Party to do so. 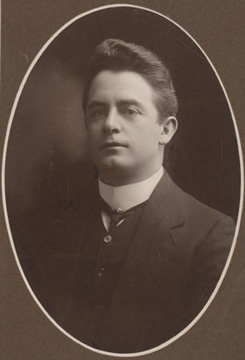 When the state executive expelled him from the Labor Party, Russell complained that it had exceeded its powers in its instructions to Labor parliamentarians over the conscription issue. He affirmed that conscription for overseas service was a matter outside the platform which members had agreed to uphold when elected to the Parliament. He thought he had been made to suffer for Hughes’ sins, and accused the Executive of ‘tyranny’. Russell became an assistant minister in the National Labour Party Ministry. When, in February 1917, the Ministry was reconstructed to facilitate the entry of Joseph Cook’s followers into the Government, Russell retained ministerial office as Honorary Minister, with a range of responsibilities central to the economic conduct of the war. In March 1918, he became Vice-President of the Executive Council. Already carrying a heavy workload, in 1918–21 he was also chairman of the Australian Wheat Board, had responsibility for the jute and butter pools, and served as vice-president and president of the Commonwealth Board of Trade. He assisted Senator Pearce in the defence portfolio and, for much of 1919, acted as Minister for Defence during Pearce’s absence overseas. As acting Leader of the Government in the Senate during the absence of Senator E. D. Millen from October 1919 to February 1920, Russell was under considerable pressure. The heavy load of legislation following the end of the war, as well as the strain of the war years, had taken their toll. Speaking during the adjournment on 24 October 1919, Senator de Largie commented that he could not remember any minister having been ‘subject to a heavier strain than that to which Senator Russell has been subjected during the last few weeks’. Failing health seems to have led to Russell being dropped from the Ministry in December 1921. By 1923, his mental condition was such that his public life had virtually ceased. He died on 18 July 1925 in the Sunbury hospital for the insane. Still a Senator at the time of his death, he was buried in Brighton Cemetery. His wife, two sons, Edward and Gordon, and three daughters, Edna, Hilda and Doreen, survived him. Russell was described by Pearce as ‘a lovable man with many fine qualities’, and by W. M. Hughes as ‘a man of capacity . . . [who] had no personal enemies’. Early in his parliamentary career, he had expressed his intention of not being ‘a mere barracker’ for his state, adding that he wanted to be ‘an Australian in the fullest sense of the term’. His service in the Senate testified to the fulfilment of his hopes. Punch (Melbourne), 14 December 1911, p. 956; Geoff Browne, ‘Russell, Edward John’, ADB, vol. 11; Herald (Melbourne), 18 July 1925, p. 1; Argus (Melbourne), 20 July 1925, p. 10. Socialist (Melbourne), 4 May 1907, p. 6; G.C. Hewitt, A History of the Victorian Socialist Party 1906–1932, MA thesis, La Trobe University, 1974, p. 40; Bulletin (Sydney), 10 January 1907, p. 18; Socialist Party of Victoria, Minutes, 12 November 1907, Sam Merrifield Collection, SLV; Letter, E.J. Russell to Tom Mann, 30 July 1907, R. S. Ross Papers, MS 3222, NLA. Labor Call (Melbourne), 25 July 1907, p. 7. CPD, 8 October 1908, p. 925; Punch (Melbourne), 14 December 1911, p. 956. CPD, 11 July 1907, p. 393, 19 June 1912, p. 23, 13 December 1911, p. 4210, 11 February 1908, pp. 7926–7927, 8 October 1908, p. 924. CPD, 26 May 1909, pp. 11, 16, 11 October 1907, pp. 4606–4608, 12 December 1912, pp. 6869–6870. CPD, 26 May 1909, p. 15. CPD, 29 May 1914, pp. 1681–1682. Ross McMullin, The Light on the Hill: The Australian Labor Party 1891–1991, OUP, South Melbourne, Vic., 1991, pp. 107–108. Political Labor Council, Central Executive, Minutes, 12 September 1916, 26 September 1916, Democratic Labor Party Papers, MS 10389, SLV; CPD, 14 December 1916, pp. 9761–9767, 20 December 1916, pp. 10276–10278. CPD, 12 August 1925, pp. 1327, 1330, 11 July 1907, p. 396, 24 October 1919, p. 13999; Herald (Melbourne), 18 July 1925, p. 1; Argus (Melbourne), 20 July 1925, p. 10. This biography was first published in The Biographical Dictionary of the Australian Senate, vol. 1, 1901-1929, Melbourne University Press, Carlton South, Vic., 2000, pp. 304-307.